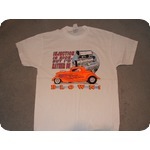 Old hot rod coupe with blower and engine on a new large white tee shirt. Front print only with "Injection is nice but I'd rather be Blown" and the car/engine. last one.